A must-visit place for families, especially kids who wish to enjoy a long time on the beach in their own way! Port of Lost Wonder is the first kid’s club in Singapore letting your kids to experience unique bonding of the family. There’s a large pirate ship in which your kids can play, climb up steps and swoosh down slides. When the sun’s rays get scorching hot in the afternoons, kids can take short breaks and retreat under thoughtfully provided sun shades at the sand play area and enjoy quieter moments of creative sand craft. There are also daily play programs and activities which are organized by the Port of Lost Wonder. 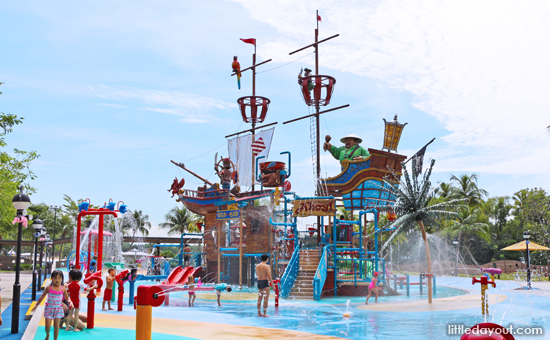 Attractions like water play area, themed islets and few leisure activities are exclusively arranged for young innocent hearts. Being a parent, you will definitely enjoy the wide smile in your kid’s face.